I like participating in Gardening Gone Wild's Picture This photo contests because they're always challenging and I always learn something from the winners, contestants, and judges. This month's subject is "The End of the Line", apropo for the season I think. It can be taken metaphorically, literally, or both. I chose to take a stab at both with my photo. This is a photo from very early March a few years ago. It's out in the country somewhat close to Sisters Bulb Farm, a bulb farm no longer in business but one that used to supply old fashioned narcissus to other companies. 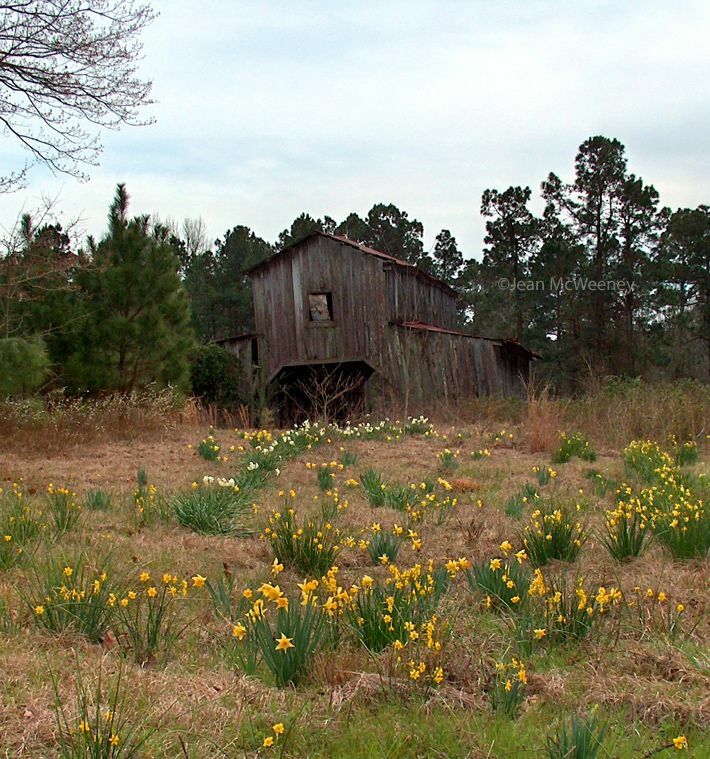 My imagination flows with thoughts about this old barn and its line of daffodils up to the door. Was there a house nearby? Did the owners get their bulbs from Sisters or were they related to the owners? Does that white line of daffodils indicate an old drive? Where are the owners or their descendants now? I do know that the barn has since been torn down. Do the bulbs still come back or was the destruction of the barn the end of the line for them as well? I hope to answer that question next March; that is, if I can still find this place. What a beautiful photo of a really cool place. Too bad the barn is gone now, but I bet the Daffodils are still there. I've found Daffodils growing on the site of demolished homes long after any other evidence of the buildings had vanished. I love old barns. Too bad it was torn down! I hope that the flowers still remain. So many questions. The perfect exemplar of the picture being worth a thousand words. The old barn is so poignant. Really enjoyed my visit here. Jean, this is the photo I mentioned to you not long ago. I'm crazy about it and very happy to see it. Reminds me though.....I still have some bulbs to plant. I really like the mix of the barn in near-collapse with the perky bulbs in front, the contrast of something human-made falling to earth with plants springing out of it. There's a town in the mountains a hour's drive from here where one of the residents has made it her project to plant thousands and thousands of daffodils around town. There is no missing spring when it arrives! What a gorgeous photo, Jean! And it has such a story to tell. It does make you wonder whether someone once lived here and lovingly planted all those daffodils and what became of them. I'm glad I don't have to be a judge for this contest! Good luck! Wonderful photo. I love old barns, and am sad to hear this one is now gone. Thanks for the nice comment on my entry. I have always preferred more "mature" beauties - there's usually quite a bit of wisdom there too.